Riverbank Cottage is ideally placed halfway between Napier and Hastings so perfect for seeing all the attractions, wineries and cycle trails. The cottage can sleep up to 4 people (max 3 adults only). It is situated in our large tree filled garden, has a queen bed in a combined living/sleeping area and a separate bedroom attached with two single beds. Small KITCHENETTE area with microwave and portable electric hot plates for LIGHT COOKING only due to open plan layout. (PLEASE NOTE there is NOT a full stove/oven in the cottage). Mini bench top oven/grill provided. The use of the BBQ facilities is encouraged when possible. 32" LCD TV with Sky. FREE Wi-Fi included. Heat Pump/Air Conditioning. Electric heater and electric blankets on all beds. Covered deck with private BBQ/garden area. We also have a studio cottage which is ideal for additional family/friends. 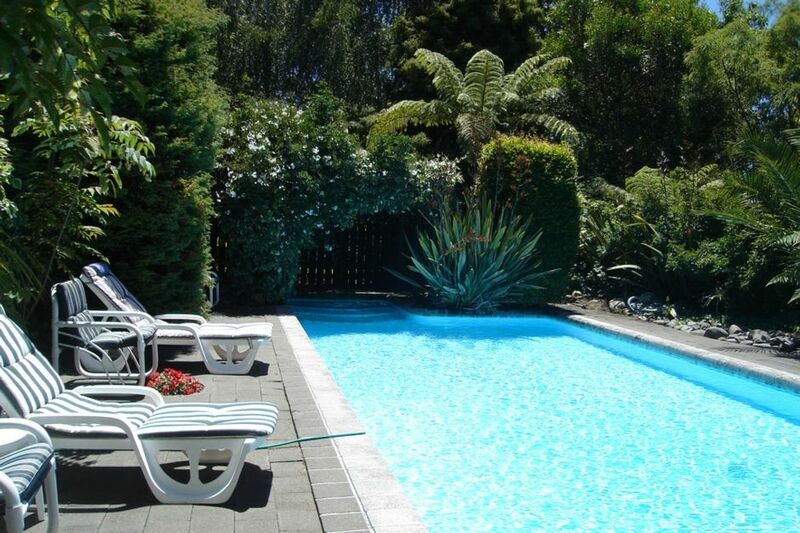 Beautiful swimming pool for you to enjoy in the summer months, fully fenced with separate gate access. Safe for children. Strictly for paying guests only, sorry visitors cannot use the pool. Private gate access from end of the garden to the cycle/walking path along part of the Clive River. Links up to all the Clive, Hastings and Napier cycle ways. If you are keen cyclists and want to explore the Hawkes Bay trails we have plenty of space so that you can bring your own cycles. We also have two adult mountain bikes with helmets available for use, if suitable, so that you can try out the local trails in Clive. Please enquire at time of booking. Please note that this cottage may be unsuitable for people with mobility issues as there are steps and narrow spaces to manoeuvre through. Smoking outside cottage only. Not in pool area. For guest use only. Available Nov-Mar (seasonal). Not heated. We spent a lovely weekend at the cottage. It is a great place to relax, go for a swim in a pool or read a book. Very quite and peaceful as it is surrounded by a large garden. Feels almost like living in a park but without all the people. Janet has been a great host. Cottage is clean and well set up. It's quiet set in park like grounds, has privacy and excellent access to swimming pool. The cottage is well positioned to be able to get to Napier, Hastings and Havelock. Would stay again. this is a gorgeous property with everything you could possibly need.